'One lesson to emerge out of the Modi-Putin summit is that India can be more self-confident that it possesses inherent strengths to leverage its interlocutors to influence Pakistani policies,' says Ambassador M K Bhadrakumar. IMAGE: Prime Minister Narendra Modi greets Russian President Vladmir Putin at the BRICS summit in Goa, October 15, 2016. India-Russia relations were destined to get an upgrade at Goa on Saturday, October 15, at the annual summit of Prime Minister Narendra Modi and President Vladimir Putin. The expected happened. 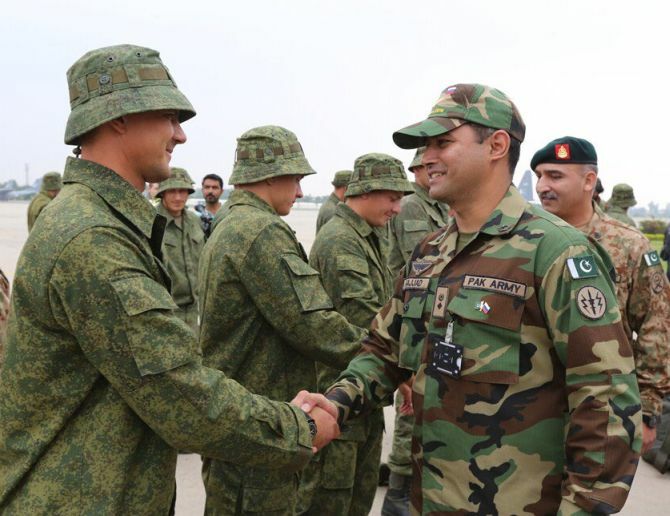 The recent Russian-Pakistani military exercise played its part in compelling the Indian leadership to take note that the benign neglect of the 'time-tested' relationship led to atrophy and a certain drift was apparent. However, the poignancy of this realisation cannot be understood except by locating the India-Russia relationship in a geopolitical context. The fact of the matter is that the 'defining partnership' with the US, which India has been celebrating, has failed when India needed it most. Washington toed a careful neutral line repeating the hackneyed mantra that India and Pakistan should exercise restraint, talk and resolve problems; terrorism is a regional phenomenon; Pakistan has been a partner in counter-terrorism; and, talks must take place to resolve Kashmir problem. Washington's line actually works in Pakistan's favour, given the Obama administration's business-as-usual attitude to Pakistan. Secretary of State John Kerry met Prime Minister Nawaz Sharif two days after the Uri attack and agreed on a common stance in regard of Kashmir. The US-Pakistan Defence Coordination Group met in Islamabad 5 days after Uri attack. Washington's priorities are clear. Defence Secretary Ashton Carter plans to visit Delhi, 'eager to get as much done as humanly possible' by way of arms deals since 'the conditions and the personnel in both capitals are uniquely favourable at the moment and are eager, and to consolidate and institutionalise the progress,' to quote from a recent Reuters report. On the other hand, the China-Pakistan 'all-weather friendship', which historically worked against India's interests, is transforming as a regional alliance. On a broader plane, Russia-US tensions are on the rise. Moscow increasingly looks at the world through the prism of a New Cold War (which can no longer be ruled out). The consequent Russian-Chinese entente is a marriage of convenience. Neither seems interested in an alliance, but they have drawn exceptionally close with the shared objective of pushing back at the US. Suffice it to say, for a variety of reasons stemming from the interplay in the power dynamic of the region, Pakistan is enjoying a period of unprecedented big-power attention today. Big powers want to engage with Pakistan out of self-interest. Quite obviously, Indian foreign policies have been out of sync with regional politics. Therefore, the recent Russian-Pakistani military exercise turned out to be a moment of rude awakening. 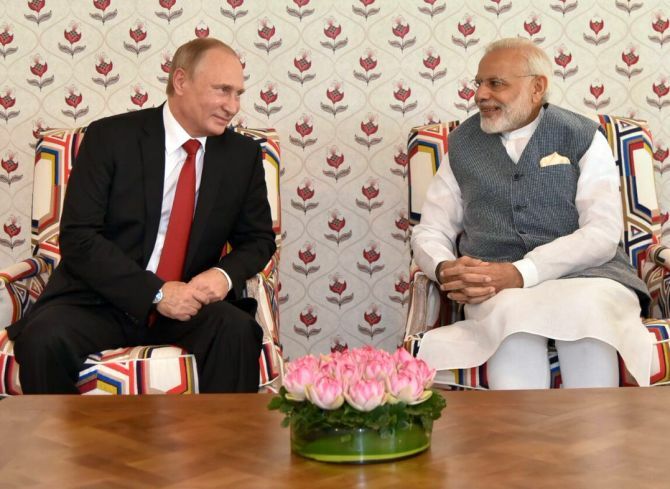 Arguably, the hugely substantial 'output' of the Modi-Putin summit in Goa has been partly at least a reaction to the Russian-Pakistani exercise. The defence deals signed in Goa worth around $10 billion reinstates Russia's pristine status as India's partner. The deals have a substantial 'Make in India' template. More importantly, Russia is entering the Indian fuel retailing market by buying up Essar Oil in a $13 billion deal, which may lead to an FDI infusion of more than $30 billion. The two countries have agreed to collaborate on two more nuclear power plants which could cost anywhere around $30 billion. The PM acknowledged publicly in Putin's presence in Goa that 'an old friend is better than two new friends.' It is an eloquent articulation highlighting the enduring strategic congruence between India and Russia. Of course, it is also a message to the region and the world capitals. The Goa summit rendered the two-week Russia-Pakistan exercise in the Khyber to be a trifle of no great import. Which is just as well. This is particularly so when the bit exercise in Khyber -- rock climbing, etc -- is compared with the recent US Air Force's Red Flag exercises in the Nevada desert, which lasted 10 days, involving Israeli and Pakistani fighter jets and refuelling aircraft staging dog fights and aerial simulations to improve aviation skills. Indeed, Israeli and Pakistani F-16 jets flew both day and night missions against ground defence systems. 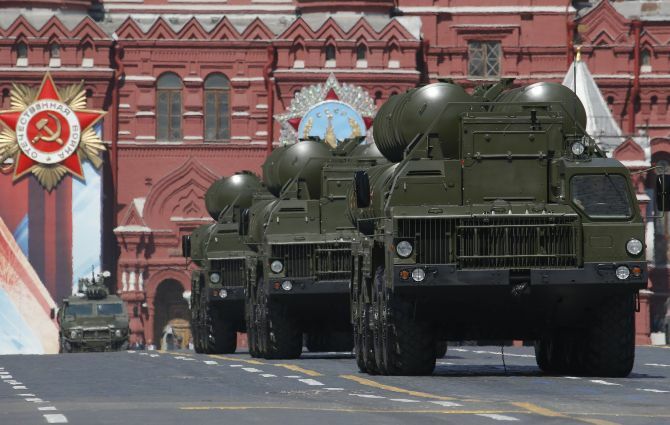 Russia's S-400 missiles with a range of 400 kilometres will hopefully enable India to tackle these US-trained Pakistani pilots with greater effect! Yet, alas, no Indian think-tanker or none amongst our former diplomats who served in America murmered a word of indignation at what the Americans have done by training Pakistani pilots to test their professional mettle against the fabled Israeli pilots -- and that too, just 3 weeks before the Uri terrorist attack. Herein lies India's profound strategic dilemma today. 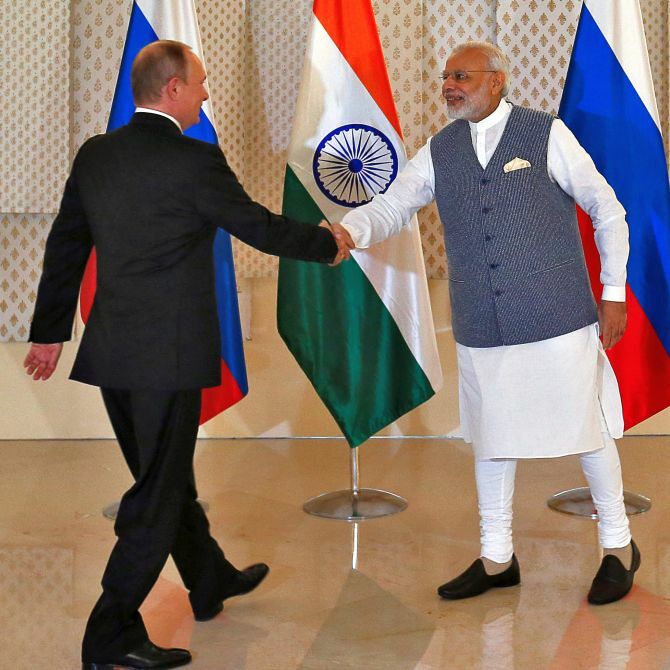 Do India's elites want to rediscover Russia's pivotal role in Indian strategies? Paradoxically, the biggest supporters of the US campaign to run down BRICS are Indians only. IMAGE: Prime Minister Narendra Modi with the leaders of Brazil, China, Russia and South Africa at the BRICS summit in Goa, October 16, 2016. BRICS is an idea that drives a dagger at the heart of the Western-dominated world order. In sheer intellectual terms, a group of emerging struck up an innovative 'Gandhian' method of challenging the established order without being confrontational and showing that the Thucydides Trap is not necessarily inevitable as a world order takes new shape. 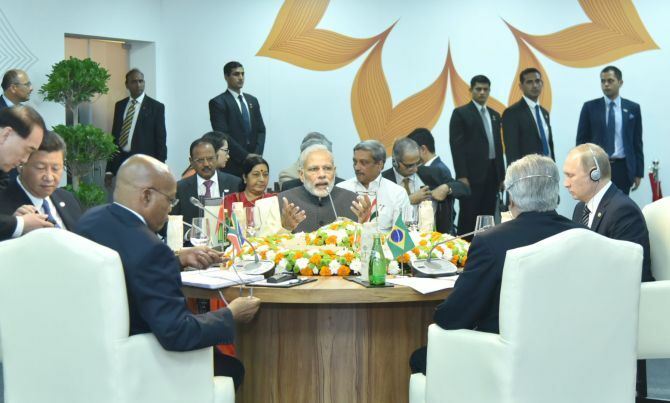 So, why should Indians be hostile toward the idea of BRICS? The point is, India's affairs with BRICS or Russia are today Washington's business too. This needs some explaining. The 'postmodernism' in the India-Russia relationship is traceable to the nineties, coinciding with the Bill Clinton administration's warming up toward India. Thus, India's relationship with Russia began acquiring an air of mild cynicism or irony toward the grand narratives of its historical meaning, experience and knowledge. Of course, the neoconservatives in the US who began dominating Indian foreign policy discourses propagated that truth and reality is contextual and constructed and there is nothing like 'time-tested friendship' or 'strategic autonomy' in the 21st century. Our strategic community accordingly swung to the other extreme -- an attitude of total negation of the very existence of objective realities. But for this intellectual fallacy, we would have understood that Pakistan is a consequential relationship for Moscow and that is the objective reality. Russia has reasons to be apprehensive that the US will inject the Islamic State virus into Afghanistan and Central Asia as part of its containment strategy. Thus, it is important for Russia to have a friendly interlocutor in Pakistan. Russia anticipates Pakistan's induction into the Shanghai Cooperation Organisation in the near future as an opportunity to strengthen regional security. Equally, taken to its logical conclusion, the China-Pakistan Economic Corridor would create new market conditions as Pakistan transforms as a middle-income country. Here we run into one of the major weaknesses of Indian diplomacy, which is currently stressing Pakistan's 'isolation' and applying the litmus test of friendship on other countries' willingness to downsize their respective ties with Pakistan. One salutary lesson to emerge out of the Modi-Putin summit is that India can be more self-confident that it possesses inherent strengths to leverage its interlocutors to influence Pakistani policies. PM Modi's audacity to bury the postmodern era of India-Russia relations is borne out of the confidence that India has the wherewithal to change the regional security calculus through diplomacy and a 'win-win' spirit. Given the sheer depth and profundity of the India-Russia friendship, there is no strategic risk if Moscow can play a constructive role as a moderating influence on Pakistan. Similarly, India should seek a strategic dialogue with China as well rather than making the unrealistic demand that Beijing should help us to 'isolate' Pakistan. The CPEC is an objective reality. Indeed, a rare opportunity was lost at the 'outreach' at Goa. A purposive, far-sighted choice for the 'outreach' should have fallen on the BMIC (Bangladesh-Myanmar-India-China). That would have brought PM Modi and President Xi Jinping too in a 'win-win' setting. Putin would have given a helping hand too.